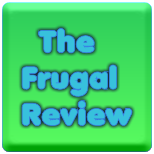 FRUGAL REVIEW: Tons Of New Printable Grocery Coupons! 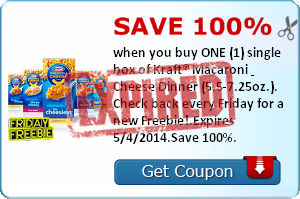 Save 100% when you buy ONE (1) single box of Kraft® Macaroni & Cheese Dinner (5.5-7.25oz.). Check back every Friday for a new Freebie!.Expires 5/4/2014.Save 100%. Save 55¢ when you buy any ONE (1) bag of Snyder's of Hanover® Seasoned Sourdough Nibblers, Braided Twists or Pretzel Sandwiches..Expires 6/5/2014.Save $0.55. Save $1.00 when you buy any TWO (2) Wasa Crispbread Crackers..Expires 6/4/2014.Save $1.00. Save 40¢ when you buy ONE (1) CUP any flavor Liberté® Greek or Liberté® Méditerranée® yogurt..Expires 5/31/2014.Save $0.40. Save $1.00 when you buy FIVE (5) CUPS any variety Yoplait® Greek or Yoplait® Greek 100 yogurt..Expires 5/31/2014.Save $1.00. Save 50¢ when you buy any ONE (1) BOX Cookie Crisp® cereal. .Expires 5/31/2014.Save $0.50. Save 50¢ when you buy ONE (1) BOX Trix® cereal.Expires 5/31/2014.Save $0.50. Save 50¢ when you buy ONE (1) BOX Original Cheerios® cereal (the one in the yellow box)..Expires 5/31/2014.Save $0.50. Save 50¢ on syrup when you buy ONE (1) 20 OZ. OR LARGER Original Bisquick® OR Bisquick Heart Smart® Baking Mix, OR 10.6 OZ. Bisquick® Shake 'n Pour® Pancake Mix..Expires 5/31/2014.Save $0.50. Save 50¢ when you buy TWO (2) BOXES any Nature Valley® Granola Bars (5 count or larger), Nature Valley® Granola Thins, Nature Valley® Soft-Baked Oatmeal Squares OR Nature Valley® Breakfast Biscuits..Expires 5/31/2014.Save $0.50. Save 50¢ when you buy any ONE (1) flavor 32 OZ. Mountain High® yoghurt..Expires 5/31/2014.Save $0.50. Save 50¢ when you buy ONE (1) PACKAGE any flavor 4 OZ. OR LARGER Green Giant™ Veggie Snack Chips, Green Giant™ Baked Veggie Puffs OR Green Giant™ Baked Sweet Potato Fries..Expires 5/31/2014.Save $0.50.